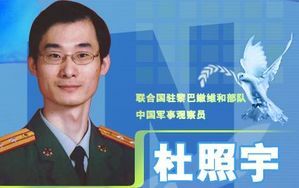 Chinese UN peacekeeper Lieutenant Colonel Du Zhaoyu was killed in Lebanon by an Israeli rocket on July 25, along with three other UN peacekeepers. China was already not supportive (to say the least) of Israel’s bombing of Lebanon and Lebanese civilians, and this death only adds fire to an anti-Israel stance. An online memorial has been set up for Du, with special sections on his military career, his lifestory, major events in his life, memories from family and friends, and media coverage. Visitors can also leave notes, with or without virtual flowers (at August 7 at 10 in the morning about 3000 flowers had already been sent), as long as they post an email address and name. I posted one in English and it didn’t appear. We can get a sense from the posts of what kinds of messages are deemed acceptable by the military and Party organizations that host the site. Life is short. Your life was lived well! Go in peace. You are the pride of the people. I hope you are continuing to protect world peace in another world. You are a hero. You are a son of the Chinese people. You are a model for us all. The homeland is getting stronger. We will be righteous in the future. We will keep our promises. Our voice will be like a tsunami, we will command the attention of the world. We will command the attention of the United States/Japan/Israel. Then, you will lead our way. You will enlighten us as we continue gathering strength. A martyr’s blood will not be spilled in vain!